To achieve a high yield of shale gas/oil collection, breakage of the low-permeability shale reservoirs where gas/oil is encapsulated is desired. The interaction between a hydraulic crack and weak interfaces, such as bedding planes, serves the purpose of cracking shales to form fracture networks in the reservoirs. Such a process may be influenced by crack deflection, anisotropy of shales, crack-plane friction and crustal stress, and the deflection of the hydraulic crack along the weak interface is essential for the formation of such a network. Mechanically, the critical deflection condition of a hydraulic crack is the key to understand the puzzle about network formation. The criterion could guide engineers to optimize the hydraulic fracturing design, which helps obtaining more reasonable crack paths for gas/oil collection. 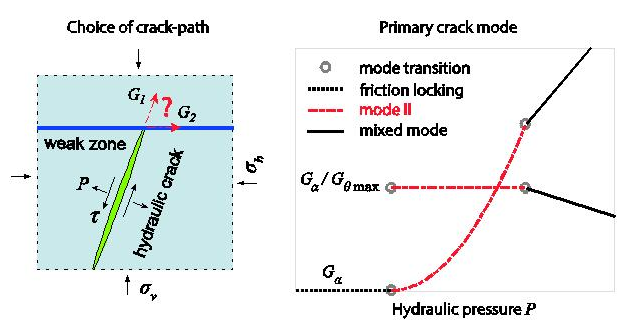 3) In mode II fracture stage, crack-plane friction and crustal stress differences do not influence crack propagation directions, and the impinging angle between the hydraulic crack and the weak interfaces is the determining factor that accounts for crack deflection. The research is published in Journal of the Mechanics and Physics of Solids. Funding supported by National Natural Science Foundation of China is acknowledged (NSFC) (11425211).